Earlier this year, we opened our second Model Home Court at Rountrey concept in our Graythorne neighborhood. We’re pleased to note the feedback has been even greater than the first! 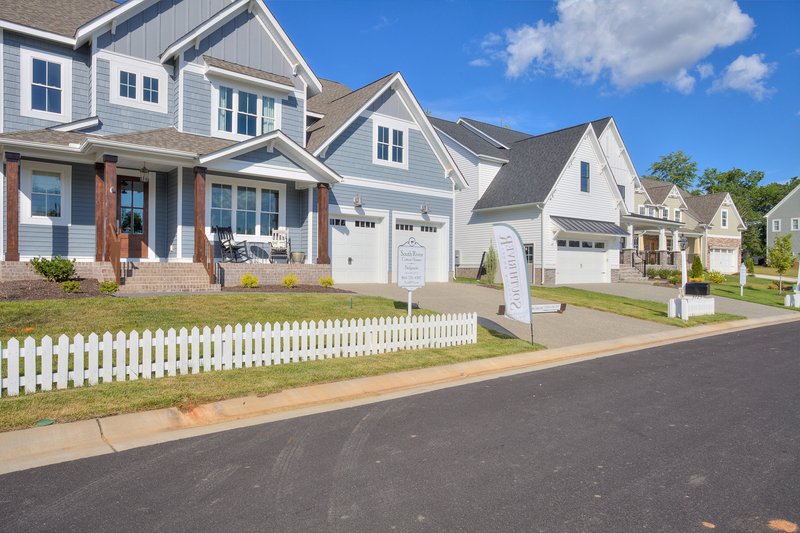 White picket fences line the street and historically-inspired model home signs full of uniqueness identify each model with builder information. Our newest row of models feature six furnished models by the following builders: Craftmaster Homes, Covenant Building and Design, LeGault Homes, Ray A Williams Custom Homes, River City Custom Homes, and South River Custom Homes. These builders range in size from smaller to larger. What they have in common is they can customize the home you’ve always dreamt of while still enjoying the community feel full of social events and fun! What exactly is a Model Home Court you may ask? It is a row of homes to make home shopping a much more convenient experience for the home buyer! Not only can you park and see model homes, but also our clubhouse and community facilities as well! You can envision your front door, but also your family splashing their way through the Summer as well. Our standout community clubhouse is the host of several annual resident events including surprise birthdays, rehearsal dinners, business dinners, ceremonies, and so many more memories are created by our residents. Our model home court, to the right of the clubhouse in our Graythorne neighborhood, is convenient to anywhere in Richmond! Less than 20 minutes and you can be exploring trendy RVA with your loved ones. Home to our newest sections and our future Swift Creek Park, lot options in Graythorne include water views, cul-de-sac, private and wooded, and/or within walking distance to the fitness center! Address for amenity/court is 3800 Graythorne Drive Midlothian, VA 23112. When you turn onto Norland Drive, take a right to peruse each stunning design. Shopping For a Home Can Be Stressful, But We Aim To Make It Simpler! The “Why” – Shopping for a home can be stressful, especially with many options for home builders within one community. This is why the idea of one row of homes is so attractive. It’s sort of like an outlet mall for homes! Instead of wasting multiple days or weekends home shopping, check out all of our models who are open daily from noon to five. The “What’s Next”. On September 22 from 12-4, come kick off Fall while having family fun and checking out over 10 gorgeous custom homes that are move-in ready (as well as our beautiful models!). While you’re here, you can give back to Feedmore of Richmond by donating canned goods (List of items needed here) and with a donation, you will earn a raffle entry for a Lowe’s Gift Card courtesy of Paul Jones of George Mason Mortgage, LLC! Event is free of charge and will include a moon bounce for kids, Boardwalk food truck, and Granny’s Ice Cream! Residents will be tailgating in celebration of Football season in the clubhouse parking lot so feel free to join us! See you on the first day of Fall!